Bridges at San Felipe Street and Westheimer Road that cross a drainage ditch formally identified as W129-00-00 will be completely or partially closed while they are reconstructed as part of the Harris County Flood Control District's W129-00-00 Channel Enclosure Project. (See attached project area map.) Changes in the construction schedule have delayed the expected bridge closures from previously published dates. As of November 2012, the work at Westheimer and San Felipe is expected to begin in early 2013. Please note that all closures are subject to change. 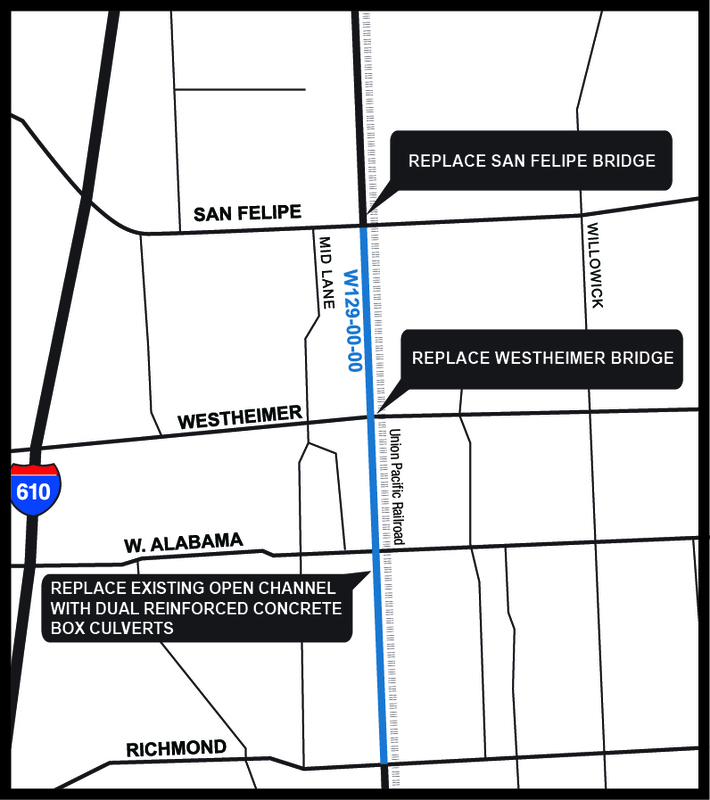 The bridge reconstruction projects will require all lanes on the San Felipe bridge to be closed for up to two weeks and traffic flow on the Westheimer bridge to be limited to one lane in each direction for approximately one month. The bridges will not be under construction at the same time. The Flood Control District will establish detour routes to aid in the flow of traffic during the bridge projects and will provide an advisory to area residents, the media and other interested parties in advance of bridge construction.